Setting up Windows7 64-bit Computers at the Family History Center Our new computers arrived, 5 shiny new 17" Dell laptops with Windows7 Home Premium (64-bit), and a Dell multifunction wireless printer. This involved the removal of five miscellaneous old Windows2000 and XP machines, and the tons of cables that connected them to the router and connected them to the multi-port printer switch. Yes, we had one of the world's last functioning 4 port manually-switched printer switches. The Stake Tech Specialist installed the new wireless system, and that part is working like a charm. The only wires now are the power cords and the security cables. Suddenly we have more work space. Having new computers required installing almost everything. A FHC support missionary said that they do not support Windows7 and that we might need the Disk Image CD that installs WindowsXP, but he wan't sure and transferred me to HQ Support. There I was assured that Windows7 would be no problem, although the 64-bit version might bring a few extra challenges. He instructed me to go to http://remote.familysearch.org/ and run the FHC software. This installed the the LANDesk software, which gave us access to the FHC Services Online Portal. (This is a slow installation, so save the installer to a flash drive and copy it to each computer so that it can be installing on multiple machines simultaneously.) I found that the revision number on the installer does not match the version installed, but it still worked. We were able to signin again to the Online Portal and http://ancestryinstitution.org/ so our main online research tools were now functional. I installed the free OpenOffice software and set the file associations so that MS Office files would open automatically in OpenOffice instead of the 6-day trial version of MS Office. I ran into a problem using the LANDesk Desktop to download and install the 3rd-party affiliate software such as AncestralQuest, FamilyInsight and Rootsmagic. I called FHC Support again, and was given the download path where the installation files are stored on the local machine. I also discovered that the LANDesk Desktop required me to reboot the computer after downloading each application. I assume this is a peculiarity with Windows7 64-bit, as I could download and install several applications simultaneously with Windows2000 and WindowsXP. It was suggested that I download the software I wanted on one machine, and copy the files to a flash drive for installation on the other 4 new computers. This saved a lot of time and frustration. Church HQ Support also asked us to remove McAffee Antivirus from the new computers and install Sophos Antivirus from the LANDesk Desktop, as McAffee creates obstacles for FHC Support. Here again, we copied the Sophos installer to a flash drive for use on the other computers. Unfortunately we installed it from the flash drive on one machine rather than copying it to the computer's Desktop and running it from there. When installation takes 20 minutes, the difference between the two approaches is almost an hour and a half. (i.e. 20 minutes for simultaneous installations vs. 100 minutes for sequential installations) A second flash drive solved the problem, and we were finished before 10 PM. This week I should finish the installation of the 3rd party software. Patrons with laptops will enjoy being able to access the internet in the FHC, although the long security code may be a challenge. We are enjoying the new machines. We opted to install mice, as the touch pads are a challenge for many of our users, including me. At the FHC On Thursday I went in early and spent a few hours working on a PowerPoint presentation that provides an overview of the affiliate software provided by FamilySearch to the FHCs. Then some friends came in and I helped them researching a Strahm family that lived east of Bern, Switzerland 200 years ago. One of the very promising sources was a family website that was offline. My friend telephoned this morning to tell me that she was successful in contacting the authors of the former website via Facebook. They had decided to replace the website with a Facebook page. So don't overlook Facebook as a possible way of contacting other researchers! Corrupted Digital Camera Card Some friends mentioned that the memory card in their camera seemed to have lost the photos. The camera says the card is empty and suggests that it needs to be formatted. I offered to see whether I could recover the photos. I tried 5 different programs designed to handle this problem. One of them said it found 140 photos and then wanted to charge me $2.50 each to try to recover them. Another tried unsuccessfully, and finally reported that there were no photos to recover. The other three successfully recovered photos: Art Plus Digital Photo Recovery 3.1 recovered 112 photos, 7 of them being partial photos. http://www.artplus.hr/ This is the free version of commercial software. DiskDigger recovered 120 photos, including 6 partial photos. DiskDigger is free from http://diskdigger.org/download Recuva recovered 112 photos with no partial photos. It also identified and saved 30 additional files with names indicating that they were JPEGs taken with an HP camera. Nothing could open these 30 files. (I tried opening them with all of my graphics programs as well as Internet Explorer and Firefox.) http://www.piriform.com/recuva An online discussion gave me the idea to use a hexadecimal editor to replace the first 128 bytes of each of these 30 files, to try to rebuild the file headers. (I copied the first 128 bytes from the header of a good JPG and pasted it in place of the first 128 bytes of each of the 30 files.) This allowed me to recover another 4 photos and one partial photo. This is very labor-intensive for the results achieved, but may be worth a try if you desperately need to recover a lost photo. The hex editor I used was HxD Hexeditor from http://www.mh-nexus.de/ So the vRecuva + HxD combo (and a lot of time) allowed me to recover 116 photos plus one partial photo. Each of these progams is free, and all can be run without installation. My final judgement? In my experience, DiskDigger was best, followed by Recuva. Of course, results may differ with different users. Who is the mother of Jane and Allan Welsh? I received this email message: -----Original Message----- From: "Alastair Downey" Date: 14/08/2010 08:16 PM Subject: Re: RICHARD WELSH & Margaret SAMSON RICHARD WELSH & Margaret SAMSON The marriage entry from the Auchinleck, Ayrshire, Scotland OPR for Richard WELSH & Margaret SAMSON states they were both of this parish and they were married at Knockroon Knockroon is the name of a farm that the SAMSON family lived on By the time of the 1851 Census for Scotland Margaret was listed as follows Dwelling: 1 Gateside Civil Parish: Auchinleck, Ayrshire, Scotland Source: Volume 577, ED 4 Page 1 Jean SAMSON, Hd, wid, 75, Retired Farmers Widow; Cumnock, Ayrshire Margreat SAMSON, dau, unm, 42, House Servant; Auchinleck, Ayrshire James Samson WELSH, Grnson, 16, Soliceters Clerk, Auchinleck, Ayrshire From a headstone in the Auchinleck Churchyard this seems to be the same family Erected by John SAMSON, Knockroon, In memory of father James died 7.9.1821 age 55, mother Jane SMITH died 27.6.1854 age 79, sister Margaret 7.2.1862 age 53. Comment? Alastair Downey ~~~~~~~~~~~~~~~~~~~~~~~~~~~~~~~~~~~~~~~~~~~~~~~~~~~~~~~~~~~~~~~~~~~~~~~~~~~~~~~~~~ Wow! Besides Sarah Smith being shown as Jane (Jean) Smith, it had an even bigger surprise. If Margaret Samson Welsh was still living with her son James Samson Welsh in 1851 and died in Auchinleck, Ayrshire, Scotland in 1862, I need to reconsider her as my ancestor. I believed that she had come to Canada with her husband, given birth to Jane and Allan, and died in Canada before 1852. In 1852 Richard is shown as married to Margaret Hunter (widow of Adam Linnen). Jane and Allan are shown as children in their family. 1851/1852 Census of Ontario/Upper Canada/Canada West, Grenville, Edwardsburgh township Richard Welsh, farmer, b Scotland, Free Pres., age 43 Margaret Welsh, b Scotland, Free Pres., age 51 Elizabeth Linnen, b Canada, Free Pres., age 20 Robert Linnen, b Canada, Free Pres., age 23 William Linnen, b Canada, Free Pres., age 17 George Linnen, b Canada, Free Pres., age 15 Jane Welsh, b Canada, Free Pres., age 11 Allan Welsh, b Canada, Free Pres., age 8 So who is the mother of Jane and Allan? It seems unlikely to be Margaret Samson, unless she came to Canada and later returned to Scotland, leaving the young children with Richard. A more likely candidate would be Margaret Hunter Linnen, although Frederick Hunter's history says that they are Richard's children from a previous marriage. Last Night at the FHC Yesterday we were babysitting grandchildren, one of whom made pancakes for us in the morning and muffins in the afternoon! Then it was time to rush home, have an early supper and then drive to Edmonton for my shift at the FHC. A patron brought along a friend who was looking for information on her grandparents who came to Canada from Poland/Ukraine in 1939. She had their names and a possible spelling of the village they came from. She said that three members of the family survived the sinking of the SS Athenia by a German submarine. http://en.wikipedia.org/wiki/SS_Athenia I started by searching the FLC Catalog for the name of the place, but found nothing. Then I tried theFS wiki, and found information on Ukraine but nothing I could relate directly to the patron's needs. Next I tried the Shtetl Finder at http://www.jewishgen.org/infofiles/ShtetlFinder.html to see if I could find the place. I found 8 possibilities, but the patron felt that the place she was looking for was SW of Kiev, but probably closer than any of the places listed. She took notes on some of the places for later review. We did some Google searches, which brought up no information on the grandparents or their home village. I suggested that we next check the message boards. http://www.rootsweb.ancestry.com/ led to postings by a cousin of my patron, which in turn led to this article that included a photo of the family members who died during rescue efforts. (see below) It is quite a story! http://www.ahoy.tk-jk.net/macslog/Familyofsevenonlythreesur.html Subsequent searches found the address and telephone number of the cousin who had posted the information. Our patron will contact her cousin for further information. Writing Your Personal History I intended to write about my research on my uncle Evans' ancestry. Then I intended to write my answers to some technical questions about sorting out multiple data files in PAF (Personal Ancestral File), but my mind keeps coming back to a powerful article at http://www.familyhistoryquickstart.com/writing-your-personal-history/ In part it says, "Instead of starting out chronologically stating your life events (year by year that is), try compiling stories by topic." It then goes on to make numerous great suggestions of topics to write on. Suddenly a light went on! My attempts to keep a journal or personal history have always floundered. I think a year and a half is the maximum I have ever maintained any sort of journal. It tends to degenerate into a boring sameness. Much of my life is very routine and I am (by and large) very comfortable with that. People whose lives are full of danger and excitement tend to come to a short if dramatic end. I have things I still want to accomplish before departing this life. Incurring danger deliberately just so that I can tell everyone that I live dangerously seems rather pointless to me. I get more satisfaction from being in a situation where I can help people in various ways. Writing my personal history by topic seems more interesting because after a page or two, my reader is introduced to a different aspect of my life's experience. So far I have written on housing and on transportation, with many additional topics to cover. And if I never finish, I have at least introduced my family to two topics that they might not have known about me. I think that family histories are important. I suggest that you try this approach to writing your personal history. The link above will help you to get started. Let me know whether it worked for you. 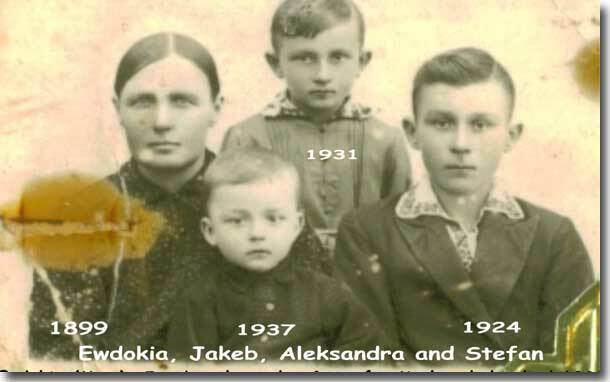 Family history deals with both our roots (ancestral families) and our branches (descendant families). Last weekend, I had to choose between them. It was the Ing family reunion ... possibly the last one where the four surviving children would be present. It was also my daughter's family's move to a somewhat remote town, where she would begin her teaching career. As the family historian, I had been looking forward to the reunion for the past year, but as a parent I knew where my first priority had to be. My daughter and my son-in-law Ed would be driving their vehicles, a son and daughter-in-law (J&K) were camping near the destination. I was needed to drive the moving van. My wife (who doesn't drive in the city) dropped me off at a son's house, and we picked up the 26-foot rental truck. With help from other family members and friends, we loaded the truck in Edmonton. Then I set off for Wabasca-Demarais. I decided to by-pass the city of St Albert, to save time and effort. But on the new route I kept looking for a gas station as I anxiously watched the fuel gauge of the unfamiliar vehicle drop lower and lower. At Westlock I was able to buy gas, and I proceeded with more confidence. At Slave Lake I called J&K to let them know where I was. They told me that they were waiting for me in Wabasca and that Ed was about an hour behind me. From Slave Lake to Wabasca is about a 90-minute drive, through seemingly unending forest. I had supper with J&K while waiting for the others to arrive. Then we followed Ed to the house, and unloaded the truck. I am not very good at moving heavy items but helped reassemble the furniture. The rest of us slept there, while Ed drove back to Edmonton with two young men he had hired to help. 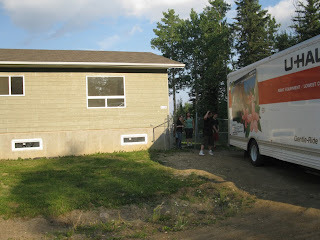 The next morning I dropped off the one-way rental truck in Slave Lake, and rode back to Spruce Grove with J&K. We arrived partway through church. After church my dear wife and I drove home. I had lunch and then drove to the reunion. Only two couples were still there, so I visited with them. My aunt Myrtle and uncle Evans talked to me about another reunion coming up soon, and asked what information I might have on his ancestry. So for the past few days I have been researching his ancestry. Fascinating stuff! I now know that he is of native Indian descent on one of his lines. I don't think he knows that! Tonight I have a shift at the Family History Center. I wonder what adventures await me there!